A trio of signed football shirts are up for grabs in a charity prize draw set to raise money for local children’s hospices. 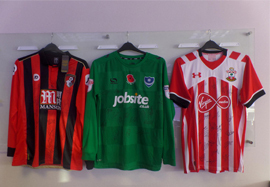 Estate agents Leaders has secured signed jerseys from Premier League clubs Southampton and Bournemouth as well as League Two champions Portsmouth. All proceeds from the prize draw will be donated to its charity partner Together for Short Lives. Karen Arkell, branch manager at Leaders in Sarisbury Green, which is organising the prize draw, says: “Three lucky fans will win the signed shirts, which are particularly attractive this year as all three of our local teams have just enjoyed successful seasons. “People are invited to enter the prize draw for their shirt of choice, so we are looking forward to seeing which club’s fans are able to raise the most money. Will Southampton, Portsmouth or Bournemouth’s shirt prove to be the most popular? Tickets must be purchased by 30th May, with the winner of each shirt set to be drawn on this date and notified shortly after. Anybody who would like to view the shirts can do so at Leaders in Sarisbury Green, where they are on display. For more information contact the Sarisbury Green branch on 01489 573999.